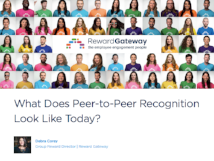 Download our highlight “What is Peer-to-Peer Recognition” to discover the ins and outs of peer-led recognition and top examples of tailored eCards. While manager and leadership-led recognition efforts are important, peer-to-peer recognition is a powerful, often overlooked tool which increases employee collaboration and company morale. In fact, peer-to-peer recognition is 36% more likely to have a positive impact on financial results than manager-only recognition. So what kinds of peer-to-peer recognition can you put in place? One example is peer-to-peer eCards, completely unique to your business goals and brand that drive values-led behavior so your employees are recognized for actions that help contribute to a company’s bottom line through living core company values. Peer-to-peer recognition shouldn’t hide behind closed doors — when a “job well done!” or a meaningful “thank you” is sent and opened, others in the company should be able to participate in the moment of recognition and extend that conversation. Curious on how to answer the question of what is peer-to-peer recognition, and how it can work for your organization? Download our highlight that answers just that, plus offers great examples of how others are using peer-to-peer recognition to strengthen relationships at work and embed company values.